Oak Flooring Man is a Malpas ecommerce web design built on WPEcommerce for WordPress. 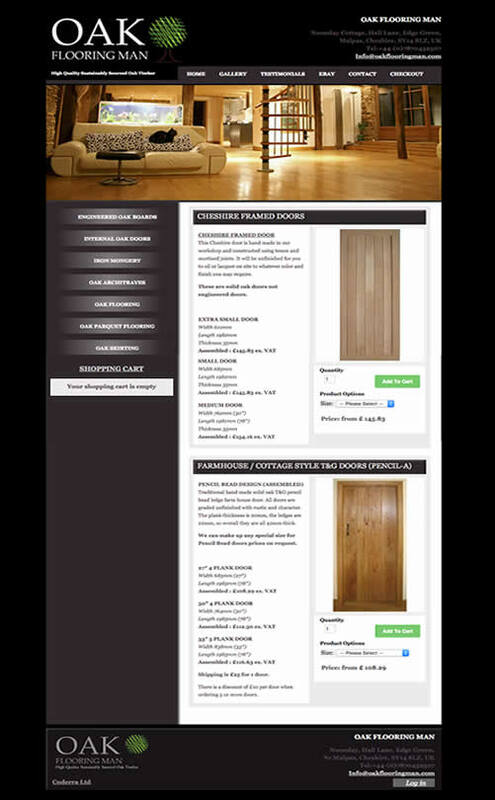 They sell oak flooring, architraves, and high quality oak doors from online through ebay and this website. This Malpas ecommerce was a bespoke build several years ago before responsiveness became standard. Even though it is one of our older sites we feel that the design still looks and feels modern. With any web site it is important to make sure that the customer has easy access to what they are looking for. Because of this the Malpas ecommerce clearly labels their contact information as well as quick tabs to relevant information. In the sidebar the customer has quick access to the products in the shop, and the cart monitor widget. They are able to monitor what they are buying and how much it will cost in real time. Rather than listing each variation as a single product the client opted to create a variable product for each. This was mainly due to the product being nearly exactly the same, with the only difference being dimensions. The result of this is that the Malpas ecommerce is small and easier to navigate. There is a built in blog in this website that is currently disabled. It is there both to serve news but also to create SEO content. We believe that one of the best ways to rank highly in Google is to provide fresh, relevant and keyword orientated content on your website. Lastly the website has a link to the ebay account, funnelling customers to another platform for purchasing their products. They felt that it was important to offer both options on the website. This was because some would trust the ebay brand more than an unknown company. Since the development of this website it is now possible to link ebay with Woocommerce for WordPress. Future development for this website may then include synching products and cross selling across platforms with little admin effort.